winter in singapore :) - A mummy's inane blabberings..
One of Aidan's wishes was to see 'snow'! When the cable car was making its way pass Mount Faber, we saw a big crowd at there and there were 'snow flakes' falling from the sky..! (I only found out later about Jewel Box's winterwonderland promo) . The cable car attendant enquired whether we would like to stop there for a while. I asked Aidan and he shook his head so we decided to skip it. On the way back, the boy was surprising silent.. But when we reached Sentosa and stepped off the cable car,the boy came out from his daze and started clamouring for snow! Arghhhh...! No, I didn't head back and he cried heaps but it was late, and I was tired. And so on his birthday, we decided to grant him his wish! You know..nothing beats seeing that look of glee on you boy's face as he reached out to touch the 'snow'. He was bobbing happily to the Christmas carols that was playing as snow was swirling about. Yes, it's only foam..and we all got wet and dirty but the whole family had fun. And one day, we'll be able to let him experience real snow..! I wish you good health and hope that you'll continue to be such a good natured, loving & affectionate boy! Last week when hub was out of town, I'd applied for a few days leave and booked us into Rasa Sentosa for 2 nights. The other half wasn't big on the island and had always turned down my suggestion of spending a few days at Sentosa so I decided to do it when he wasn't around. Aidan loved it there! He got to swim for all 2 out of the 3 days that we were there (well, he only got to dip his feet into the pool for the first day 'coz the rain poured the minute we hit the pool). And I brought him to explore the island and enjoy some of the activities it had to offer..Li' Alison came along on one of the days too and the both of them had a great time! The boy said to me when we were checking out "Thank you mommy for bringing me here! I enjoyed it!". He's really such a sweet boy! Aly and Aidan showing off their tattoos! at the Underwater World. Thankfully, I had Nenita & Emily to help me. Don't think I would have coped with 2 kids on my own! Aidan 'saving' Aly ala Baywatch style when she got stuck at the corner of the pool.. I am quite liberal but not THAT liberal hehe.. I also only thought for a very fleeting moment lah. Heh. yeah sometimes, he surprises me by his politeness..and he can be ever so sweet. many a times, he'll just come up to us, wrap his hands around us and say "I love you soooo much!" ooo! mine was on 22dec! hehe! woah close by!! HAPPY BELATED BIRTHDAY!!! have a merry christmas with ya family! Merry Christmas to you all and happy belated birfday to Aidan! Love the pic of the 3 of you and he's really such a sweet kid! For the snow thingy, how did you guys wash up after that? it wasn't that soapy..esp in comparison with the foam at Tanglin mall..we all just wiped ourselves dry and drove home quickly to have our shower..
PS: I have a Nemo picture too! I think they're real cute! And a Happy Belated Birthday to you Nicole! MAcy not around for 2 wks and he chao sai with another girl ah!! 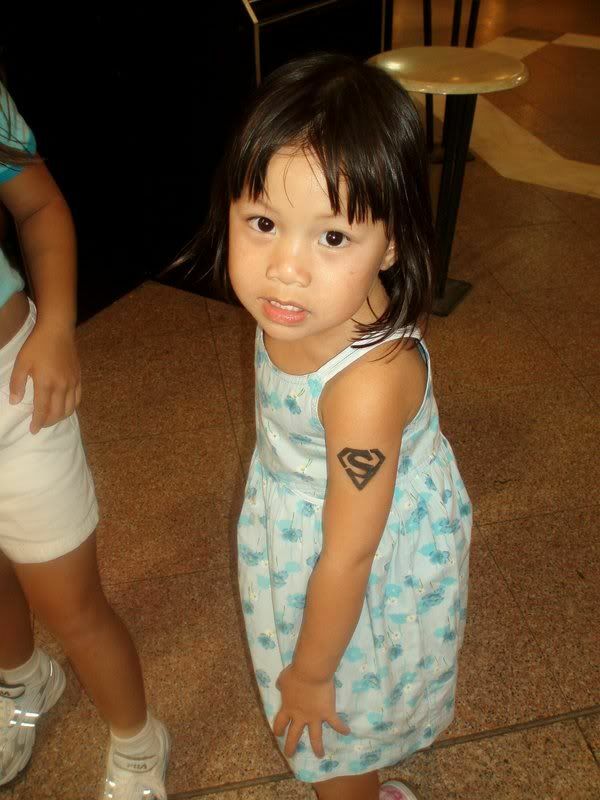 This is so funny... but Macy also got a Superman tattoo in Australia.haha..really great minds think alike! sorry hor..aidan out of sight out of mind. but after he heard macy's voice just now, he 'woke up'. he's now insisting we go ur place :D..
wah..really great minds man !